Yum! There’s nothing like a whole packet of chocky biscuits to yourself! But after the first few, you’re pretty full, so you want to save them for later right? That’s why you need an airtight jar! Not just any old plastic container or jar that you buy at the supermarket, but a genuine ‘store-it-til-the-end-of-days’ Fido Airtight Storage Jar from Bormioli Rocco. Fido Storage Jars have all the benefits of a regular storage container, but they’re better. They’re made from super-durable glass, they have loads of room inside and they feature a unique hermetic sealing system on top. A rubber gasket runs around the inner rim of the lid, so that when you push down the metal clasp, the jar is sealed and completely airtight. No more pests and no more food spoilage! So if you want those biscuits to taste just as good next week as they do today, make sure you store them in a Fido Airtight Storage Jar from Bormioli Rocco. Jar made from durable glass with volume measurement embossed on the base. 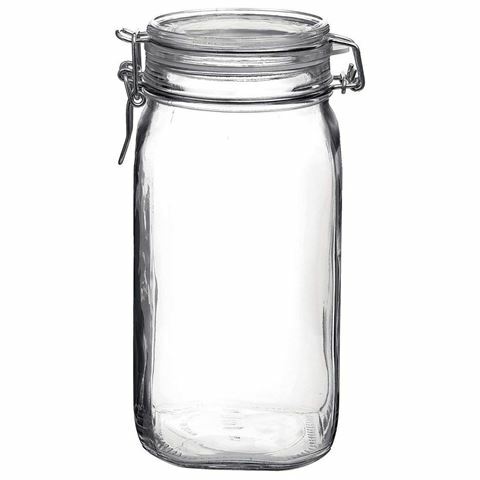 Jar closes with a metal clasp around the neck. Rubber gasket ensures an airtight seal to keep food fresh. Dimensions: 22 x 10.5 x 10.5cm.